Otto I built this castle in 1272, but all that’s left of the original structure are the ramparts and the foundation of the keep. William IV of Eberstein expanded the castle in the 16th century, as did Philip III in the 17th century. At the end of the century during the Palatine War of Succession, or Nine Years’ War, Prince Leopold Wilhelm and the nuns of the Convent School of the Holy Grave found safety here. Over time, the estate came into the hands of the Margrave of Baden. In 1802, the castle was rebuilt in a neo-Gothic style. Since 2006, the castle has been open as a hotel and restaurant. Make sure you make a reservation if you’d like to dine at Werner’s Restaurant. It is closed on Monday, Tuesday, and Saturday day, and double check this. The second restaurant is open every day during the season. Gernsbach is just 7 km east of Baden-Baden. 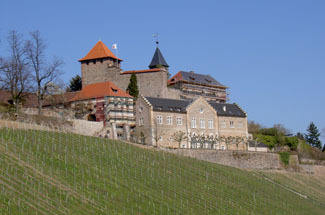 The schloss is another 2 km south of town. You’ll see it on the hillside. Perched high above the Murg Valley in the Black Forest, this welcoming castle hotel has wonderful views of vineyards and the rooftops of the town below. Your castle hosts, the Werner family, bring a personal touch to every part of your experience here. Bernd Werner was honored as one of Germany’s top young chefs, and his wife Roswitha is a certified sommelier. Well-appointed guestrooms offer every comfort you’ll need. Bathrooms are modern, and a few rooms feature whirlpools. Views from the windows vary. The main attraction that brings people up the hill is the fine cuisine served at Michelin-starred “Werner’s Restaurant.” For a bit of Gothic castle ambience, a second restaurant sits amid historic stone walls and beamed ceilings, and during the summer months, meals can be taken on an outside terrace—the perfect place to enjoy a glass of white wine. Walk off your meals on the hiking trails that start right at the hotel or take a stroll through the castle’s own vineyards.